Should auld acquaintance be forgot and never brought to mind? No, and the same applies to family. For me, the cryptic lyrics to a song so often sung on New Year's Eve has extra meaning because the day itself recalls loved ones who have gone too soon and left us behind. Sorry, but it is a struggle for me to look at this time of year without wrestling with regrets. I'll be taking the week off for the holidays, avoiding for at least one year saying anything inappropriate about Christmas. What will I be doing instead? Worship, of course! I'll decide before Friday whether I'm attending one service or two this year. It isn't an easy decision for me. While I don't regard Christmas anywhere near as highly as Easter or Pentecost from a "holy day" perspective, most Christmas Eve services are truly beautiful. I never attend out of a sense of duty. For some, that rule might stop them from attending any Christmas Eve service ... if a sense of obligation is the only reason to go. No, I'm expectantly considering whether to worship twice -- different services, of course. Like the fellowship that is unique to a particular community of faith coming together to sing, listen to music, and tell an old, old story ... I also will spend as much time as I can this Christmas Eve with the community at Simply Syndicated. This year's live broadcast online of Richard & Allison's Super Happy Fun Time is the 3rd annual. In the best possible way, those years have flown by. The first year, I listened with both tears of joy and genuine sadness as the show brought together a worldwide audience to mourn with those who had just lost loved ones but also laugh heartily and knowingly -- the way friends do when they get together. Last year, I joined in both by using the chatroom (something I have avoided on every other website) and by calling in. Yes, Richard & Allison's SHaFT is a live online call-in show. The Christmas Eve show will start before 7 p.m. EST, because that is midnight on Christmas morning in England. Sometime, likely to be shortly after 6 p.m. EST, Richard and Allison will start broadcasting live from the heart of England. When I'm not raising a candle and singing "Silent Night" in an otherwise dark sanctuary, that's where I'll be. How does this holiday gameplan reflect the spirit of Inappropriate Conversations? Perfectly, in some ways. I might be the only person following along in the first two chapters of Matthew and Luke who will be tuning into SHaFT and earnestly wondering what I've missed. I also may be the only person in the chatroom for the show who eagerly allows the sometimes outrageous humour [U.K. spelling shout-out!] on the internet to lie comfortably between two sincere moments of praise and reverence for Christmas. If that dichotomy makes no sense to you, then please keep listening to Inappropriate Conversations. It's what this show is all about. Happy holidays, however you may observe them! The impeachment of Bill Clinton near the end of his presidency was one of the most embarrassing moments in the history of the United States government. The president virtually declared that he couldn't define the word "is." More than 200 representatives in Congress demonstrated a weak grasp of the word "other." Millions of dollars were wasted on an assumption that a majority of American voters didn't know what they were doing when Clinton was elected, not once but twice! Embarrassing, indeed. It's ironic, but some of the same people who believe in confession and accountability reject any notion of a right to privacy. Without some sense of privacy, though, you cannot have true intimacy. And without intimacy, all relationships suffer - among family members, between friends, and with God. Holidays like Thanksgiving and Christmas often generate family traditions. At its best, the nostalgia of childhood forms a bond of memories that lasts a lifetime. For me, a sheet of paper folded like a triangle has spun across four decades now, resting on nothing less than the edge of brotherhood. 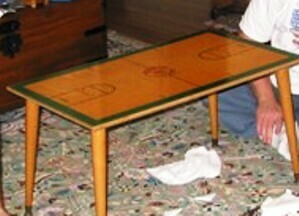 Yes, the tabletop looks like a basketball court rather than a football field.